The Starbucks reign has gone on for decades. Starbucks has risen and fallen just like a stock market line graph, but they have always come up victorious with the profits at the end of the year. Some may think the reason could be because of their strategically placed locations on every corner and in every grocery and book store known to mankind, or the fact that swarms of green apron zombies keep pushing the hot and steamy mocha flavored liquid caffeine in our faces like it's infused with heroine. Whatever the reasons for their success may be, one thing is clear, Starbucks is a force to be reckoned with like the rains of a monsoon. Starbucks has achieved consistent profits since the recession started in 2008 and has stayed at an average of 9.7% in the stock market (meaning Starbucks gets to keep $.10 per dollar they sell). Some years were better for the coffee conglomerate than others, as the graph shows, but in the ways of profits, Starbucks has shown persistence in the face of fiscal danger (YCharts.com). 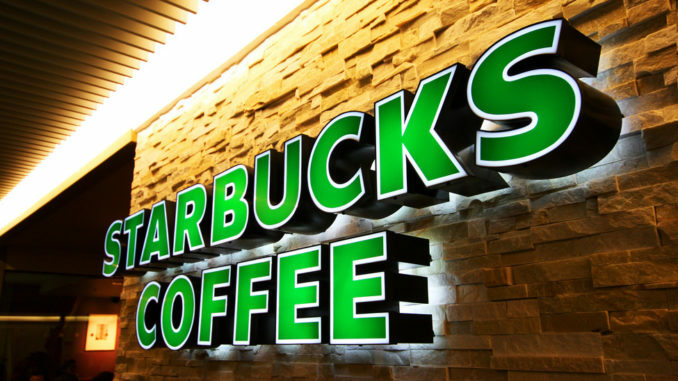 According to The Wall Street Journal blog Market Beat “Starbucks fiscal second quarter rose 19% through economic troubles in Europe…” For Starbucks to go through economic troubles and still rise 19% in four months makes me wonder what a bad year for Starbucks looks like on paper. Though with the recent, but not so recent, recession some people have cut back on certain indulgences such as cable, internet, and reduced car insurance, but some are just not ready to give up the caramel Frappuccino with soy milk and double whip cream. Spending money gives a sense of having money and in a recession the act of splurging yourself can heighten energy from a depression to a feeling a stability. In my own case, when I see empty Starbucks cups or to go food containers I feel like I'm still apart of the economic world and forget that my refrigerator is empty. So what makes Starbucks so great? A lot of the people I surveyed said location, and almost everyone I surveyed could name at least seven store locations off the top of their heads using cross streets. One person I surveyed said, “They're everywhere! It's like a bad dream where I'm running away from a monster but the monster is some community college student wearing a green apron asking me if I want whipped cream on my coffee.” And even though I don't see her comment as a positive aspect on the locations of Starbucks, she does make a good point that you can get a cup of Starbucks joe on every street corner in Sacramento. There are 20 miles or 32 kilometers between West Sacramento and Citrus Heights, a stretch of road that some should know very well growing up in Sacramento (Distancebetweencities.net). In this 20 mile stretch of concrete, whether it is highway, freeway, surface streets, or sidewalks there are at least 50 store locations all within at least 3 blocks of each other, making it very difficult in my opinion, to resist a piping hot macchiato or a double espresso (Starbucks.com/store locator). Another perspective on why Starbucks is so great was their menu. Another person I surveyed said, “I like the variety of Starbucks, some of the smaller places just don't have as much stuff.” I went to my super-secret source that chooses to remain anonymous and asked her to reveal the mysteries of the “stuff” to me. To my amazement she didn't say any illegal narcotic like I was expecting her to! The ingredients were quite simple really, no different from any other coffee shop I patronized. The ingredients consisted of espresso, coffee, mocha powder, flavored syrup (i.e. vanilla, hazelnut, caramel, etc…), teas, pureed fruit, milk/ dairy products, water/ ice, and baked goods. All sounds pretty standard to me; needless to say this information made me very disappointed. The Starbucks menu is full of smoothies and Frappuccino's, Tazo brand teas and every different espresso concoction known to mankind, so how could the ingredients list consist of less than 10 items? Then it hit me like a ton of bricks…..Secret menu! The idea of the “secret menu” is still new to me. Of course, it all makes sense; why can't the world's largest coffee shop have one? Cookies n Cream Frappuccino, Marble Mocha Macchiato, Double Dirty Chai, and something called a Dirty Hippie were only a few of the secret selections on their website (Starbucks.com/secret menu). Unfortunately these top secret drinks don't really have anything special in them, just the feeling of making you (the buyer) feel special. I recently went to a Starbucks and asked for an item off the “secret menu” and the girl in the green apron behind the meticulously cleaned counter said she had no idea what I was talking about. I was, once again, disappointed. After reviewing both location and product as the source of Starbucks' success and coming up empty handed I figured there may be something about the “place” itself. That maybe there was something worth looking at when it came to the coveted cushions of the Starbucks seating area. As I walked into the sirens lair, silently telling myself not to be scared, I took a quick glance around the room. Why was everyone staring at me? Did I have something on my face? Come to find out that it wasn't me. That look was just a normal reaction when anybody walked through the doors. I stood in line, ordered my beverage, paid for the transaction, waited to be called by my coffee name, and sat down like I belonged there; all the while wondering what wonders I would behold in the sacred land of Starbucks. As I took my first sip I looked around at the coffee congregation. The people looked like fixtures or furniture. No one really looking at the person they were with, and after a while all the “life” I had heard, not 5 minutes ago, from the patrons and the employees turned into an almost silent hum being drowned out by the occasional steam from the espresso machine. With every new body that walked through the doors the catatonic zombie heads would raise from their mind controlling cups of caffeine long enough to make the new comer feel slightly awkward and then lower as if they saw nothing. Unfortunately I found myself doing the same gesture and quickly vacated the premises hoping I hadn't turned into one of “them”. The answer to my questions on Starbucks success is quite simple, I don't know. The combination of the “in your face” locations, the extravagant menu consisting of nine ingredients strategically brewed into a million different concoctions, and the “safety in knowing you could be in a room full of zombies and not be eaten” kind of sitting room may play a big role in their huge success. Or it could be that caffeine is the last legal drug being pushed besides nicotine and liquor in the United States, and Americans are just looking for something to be addicted to. Besides, a hot cup of coffee just sounds so much better than a smoker hacking up a lung in the morning, not to mention better for your health. Whatever the reason for Starbucks having the Midas touch when it comes to business is mystery to me and I'm sure always will be, because I could care less about coffee, no matter where it comes from.